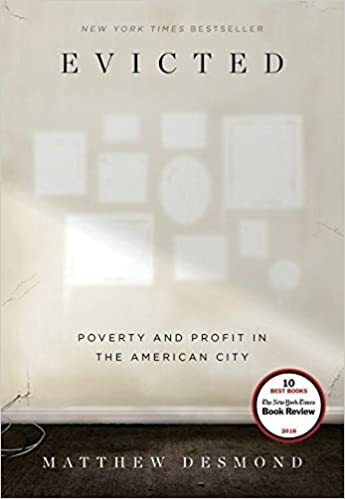 Evicted is gripping journalism, embedded in a deep knowledge of the sociological literature and history, combined with a concrete set of proposals. For his field work, Desmond spent over a year living first in a trailer park, then in a rooming house in an inner-city neighborhood in Milwaukee, getting to know tenants and landlords. His ethnography heartrending, infuriating, and, most importantly, humanizing. When I began studying poverty as a graduate student, I learned that most accounts explained inequality in one of two ways. The first referenced “structural forces” seemingly beyond our control: historical legacies of discrimination, say, or massive transformations of the economy. The second emphasized individual deficiencies, from “cultural” practices, like starting a family outside of wedlock, to “human capital” shortfalls, like low levels of education. Liberals preferred the first explanation, conservatives the second (316). As Desmond points out, the structural vs. individual dichotomy very much frames public discussion. Liberals (as the term is understood in the United States) want to provide public resources to overcome structural barriers, conservatives (again, in the idiosyncratic US sense) think the poor should pull themselves up by their bootstraps. It is hard to fathom anyone could closely read Evicted and continue to believe that all that poor people need is more grit and character. Nonetheless, liberals miss a crucial part of the problem as well. What’s missing from both the liberal and conservative frameworks with their mutual eschewal of class as an explanation is exploitation: people are poor in large part because other people are rich. Desperately poor people give over an enormous percentage of their income to landlords who possess every advantage over them – rental units are scarce for people with poor or no credit, a history of eviction, possibly a criminal record, and children (one of the most significant liabilities in finding and retaining a place to live). The result is that landlords exercise enormous power to rent or not to rent and to evict – there are almost no real checks on their discretion. Stable housing is also necessary for effective social action. Without a long term prospect of living in a neighborhood, it makes no sense to become involved with one’s neighbors or to take on social or political causes, even if one can find the time and energy. Without stable housing, it becomes difficult for people to organize to pursue their common interests. One of the greatest barriers to social justice are policies that fragment the population, leading them to think that their lives are not entwined. Housing is also efficient – it saves money in shelter costs, emergency rooms, not to mention the often invisible costs of lost productivity and the criminal justice system. But people who often have the greatest need – those who have been evicted or those who have gone through the criminal justice system – often find themselves barred from housing assistance by law. One of the paradoxes of American public policy is that there is a preference for harsh, punitive approaches to poverty – overcriminalization and prison – that are in fact many times more expensive than protecting the poor from predation and ensuring their basic needs. Desmond has specific policy prescriptions: a universal housing voucher program that covers all low-income families, combined with mandatory participating and stabilizing rent (to prevent landlords from overcharging). He argues for adequate funding to provide low-income tenants lawyers to represent them in housing court. The prospect of enacting these policies is bleak at the moment. Nonetheless, Evicted has been read widely and discussed (in Multnomah County in Oregon, it is the Everybody Reads 2017 book). It is a powerful invitation to awaken the imagination and indignation needed for change.